Residences hotel—like this one in Siracusa, Sicily--offer a cross between a rental apartment and a hotel. 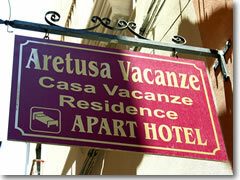 A "residence" or residenza—sometimes called an "ApartHotel" or "serviced apartment"—is a cross between an apartment building and a traditional hotel. It's an apartment available for short-term rentals, usually with a hotel-like front desk and some level of maid service—kind of like the all-suites hotels in America beloved by business travelers (and savvy traveling families). Usually, residence hotels are an option mainly for longer stays (often a week minimum, though plenty have three-night or even nightly rates), and they work a bit like having your own efficiency apartment in a doorman building. Essentially, it's a bit like getting a time share just for the week or month—only without the whole annoying sales pitch. They are often used by folks in town on business for an extended period (in fact, when I studied abroad in Rome, Italy, a "residence" near the school served as student housing for the program), but that doesn't mean travelers can't shack up in them as well. You just have to plan to stick around town for a bit longer than the average tourist. The reason this page is separate from that on how to rent an apartment is because I consider apartment rentals to be where you are getting a private apartment in a building surrounded by flats inhabited by actual local residents, whereas in one of these "residence" hotels, everyone is a visitor from out of town. For about four months back in 1993, I lived in a residence in Rome—the Residence Medaglie d'Oro, a serviceable, if otherwise unforgettable, place in the un-touristy, middle-class Prati neighborhood north of the Vatican. First day there, I was leaning over the railing of my balcony and happened to look up. Two floors above me, a young woman was also leaning on her balcony rail, so I called up, "Buongiorno!" She looked down and replied, "I don't speak Italian." Turns out she was from, of all places, Tampa, Florida and we soon became friends. Reader, I married her. I can't wait to bring our sons to Rome one day and show them the residence where Mommy and Daddy met. Booking.com (www.booking.com) - Another rare booking engine which actually lists Residences (alongside other, non-serviced flats in the "Apartments" category) in cities and towns across Italy. Biz-stay.com (www.biz-stay.com) - Keeps (farily well) updated lists of links to serviced apartment chains. The page that covers the world a bit better is at this link.